If that doesn’t tick just about every frickin’ box for what I want out of the next Jason film… Full moon, campfire, skinny dipping, “did you hear something”-style dialogue. Step back, producer folk, you almost recaptured bits of that in 2009, but if it can be rendered in a game, y’all can do it on film! The downside is that Pac Man is about my limit when it comes to ‘gaming’, so this will likely go right over my head. Sad times. R.I.P. 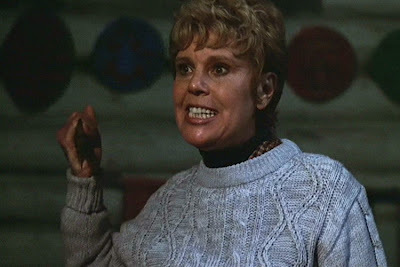 Betsy Palmer. You redefined motherly love. “Life is change. Death is dwelling on the past or staying in one place too long,” – Rachel Flax. I’ve given up my job, rented out my digs, and entrusted three boxes of DVDs to a storage locker. Thus, frequent and strong WiFi or Jeepers Creepers-esque highway psychos notwithstanding, updates may occasionally be lax. Or boring. Never fear, I’m still here (or there, or wherever) with a book of unreviewed DVDs along for the ride, so in some shoddy form or another, I WILL NEVER LEEEEAVE YOOOU. I’ve not been that thorough in covering the Halloween series around here, which is curious as I do love it so. Ka-ching! Don’t O.D. on candy. It’s the slashtasticness of it… As a dead-teenager Halloween-set stalk n’ slash film, it’s just super fun. There, pool your cash resources and get me therapy.